This Betancuria Map Map shows popular attractions, places of interest & transport locations. Click the name in the right column to highlight the location on the map. 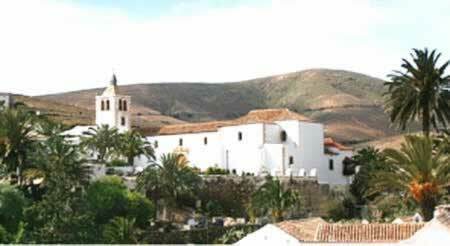 Betancuria main source of income is from day trip tourists come by car, trike tours and coach trips. Many say that Betancuria is the pretiest village on Fuerteventura. Betancuria is located approximatly half way down the island of Fuerteventura, 350 metres above sea level and 7 kilometres inland from the west coast. The nearest coastal town is Ajuy 10 kilometres. The original Santa Maria church was the Santa Maria. Some of this church and much of the island was destroyed by maurauding pirate raids by Moors, partly in revenge for the talking of slaves from Morrocco to work on the island. Some of the church icluding part of the bell tower are original. The rebuilt church is now a major tourist attraction, ensure you see the high alter with it's baroque design and the beautifully painted side alters. The Museum of Religious Art is located in Plaza Santa Maria. It displays art treasures from both the Santa Maria Church and the Convent of San Buenaventura which closed about 100 years ago. Visitors should note the Pendon, the banner flag carried by Jean de Bethancourt when he landed on Fuerteventura Island at Ajuy in the 15th century, conquered the island and founded Betancuria named after him. The Convent of San Buenaventura is now in ruins. Built in 1414 and is the oldest convent on the island. Some of the former contents of the abbey are now in the Museum. Being a day or part day trip venue Betancuria shops are aimed at tourist visitors. Besides the usual souveneirs and trinkets you can find some beautiful arts and crafts made by the locals. There is no Tourist Information Office in Betancuria. As far as we know there is only one weather station on Fuerteventura. weather stations are usually located at the airport.